Top a bed of crisp greens with grilled chicken, apples and onions and you’ve got yourself a restaurant-inspired main dish salad. 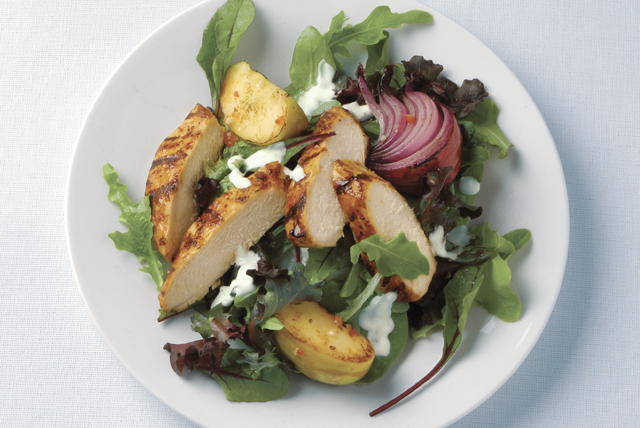 This BBQ Chicken Salad with Grilled Apples serves 4 - a perfect summer entrée for outdoor dining. Preheat barbecue to medium-high heat. Brush chicken, apples and onions with Italian dressing. Grill chicken, apples and onions 10 min. or until chicken is cooked through (170°F), turning occasionally and brushing chicken with the barbecue sauce for the last few minutes of the grilling time. Slice chicken. Arrange over greens along with the apples and onions. Drizzle with ranch dressing. Substitute Kraft Balsamic Vinaigrette Dressing for the Italian dressing.